Love and vengeance at the dark dawn of the East Texas oil boom from Joe Lansdale, "a true American original" (Joe Hill, author of Heart-Shaped Box). Jack Parker thought he'd already seen his fair share of tragedy. His grandmother was killed in a farm accident when he was barely five years old. His parents have just succumbed to the smallpox epidemic sweeping turn-of-the-century East Texas--orphaning him and his younger sister, Lula. Then catastrophe strikes on the way to their uncle's farm, when a traveling group of bank-robbing bandits murder Jack's grandfather and kidnap his sister. With no elders left for miles, Jack must grow up fast and enlist a band of heroes the likes of which has never been seen if his sister stands any chance at survival. But the best he can come up with is a charismatic, bounty-hunting dwarf named Shorty, a grave-digging son of an ex-slave named Eustace, and a street-smart woman-for-hire named Jimmie Sue who's come into some very intimate knowledge about the bandits (and a few members of Jack's extended family to boot). In the throes of being civilized, East Texas is still a wild, feral place. Oil wells spurt liquid money from the ground. But as Jack's about to find out, blood and redemption rule supreme. 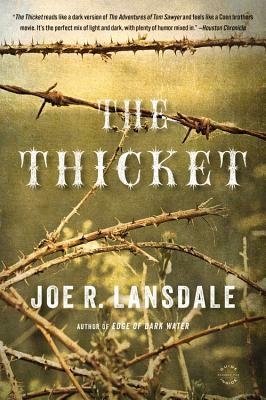 In The Thicket, award-winning novelist Joe R. Lansdale lets loose like never before, in a rip-roaring adventure equal parts True Gritand Stand by Me--the perfect introduction to an acclaimed writer whose work has been called "as funny and frightening as anything that could have been dreamed up by the Brothers Grimm--or Mark Twain" (New York Times Book Review). Joe R. Lansdale is the author of more than a dozen novels, including Edge of Dark Water, the Edgar Award-winning The Bottoms, Sunset and Sawdust, and Leather Maiden. He has received nine Bram Stoker Awards, the American Mystery Award, the British Fantasy Award, the Grinzane Cavour Prize for Literature. He lives with his family in Nacogdoches, Texas.